Being fit and healthy seems to be the mantra for many of us these days, and having access to public facilities that will help us stay in shape is happily more common than it used to be. On the East coast of Scotland, Dundee City Council have truly embraced this desire for social exercise by refurbishing a much-loved sports centre. Lochee Swim & Sports Centre in Dundee has reopened to the public with an upgrade of over £1million. The centre’s history goes back to 1895 and was in fact the largest public laundry in the city during world war two. In making these numerous improvements to the centre the flooring would need to be upgraded to a standard matching the quality of the overall refurbishment. It was a challenge where international flooring and interiors specialists Gerflor would step in with a variety of solutions aimed at delivering both quality and performance. The nine-month flooring refurbishment was awarded to Monifieth-based Longs Flooring Ltd. As part of the Dundee Trusted Trader Scheme, Longs Flooring have a reputation for quality. As a small family company they pride themselves on doing an excellent job using only the highest quality products. Chris Long, Managing Director, Longs Flooring Ltd commented, “We were on site with the Lochee project from day one and were delighted that Gerflor had been appointed to supply the flooring”. The new refurbishment would see Gerflor’s highly successful slip resistant Tara safe™ Ultra H²O chosen for the changing rooms. Intended for traditional barefoot spaces where there are continuous wet areas, Tarasafe™ Ultra H²O also offers a shod solution. It is rated Grade C in the barefoot ramp test – the best possible – and >36 in the wet pendulum test. It also scores R11 in the slip resistance wet shod test and is available in eight colours, complementing Tarasafe™ Ultra’s most popular colourways. Its weight and flexibility also allows quick and easy installation. Tarasafe™ Ultra H²O is also 100 per cent recyclable. The main reception area at Lochee would benefit from specifying Gerflor’s Taralay Premium Compact in ‘Metallica’ which would provide excellent resistance to static and dynamic loads. It has quick indentation recovery (0.02mm) and superb dimensional stability, together with providing minimal rucking when heavy objects are wheeled across the surface. This multi-layered vinyl flooring has a long lasting appearance and is also treated with the new and improved Protecsol®2 surface treatment with extreme stain resistance and a matt ﬁnish, which means no polish is required for the entire lifetime of the product, thus reducing maintenance costs. The Taralay Premium range is also 100% recyclable. Chris Long further said, “We tend to order Gerflor products more than any other type of flooring and particularly like their Taralay Premium Compact which welds together very nicely”. He also added, “they have a great range of products that cross over both the domestic and contract sectors which is great for us”. Chris Long went on to comment, “we met with the Gerflor team on more than one occasion with regards to Lochee and found them hugely helpful and responsive. In fact, they were on the end of the telephone anytime we needed them”. 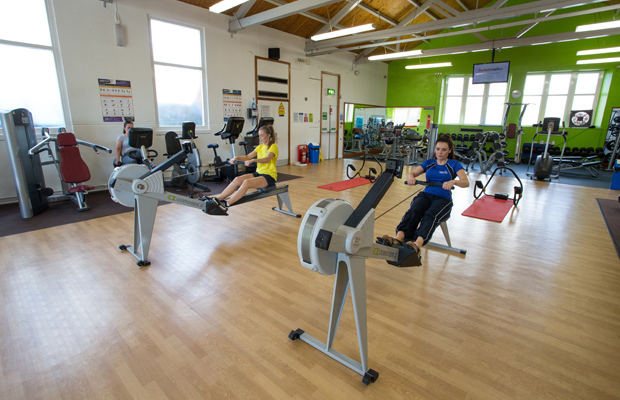 No sports centre would be complete without a state-of-the-art fitness suite and Lochee Sport and Swim saw this as a major element of the overall offer to the public. Taraﬂex® Sport M from Gerflor would be the ideal choice for this area. Taraﬂex® has been used in many international and major sporting events since 1976 and is available in 17 colours and two wood-effect designs. The Sport M Evolution product offers a P1 category shock absorbency 25% to 35% and meets the EN 14904 Standard for indoor sports surfaces. Taraﬂex® also recognised for providing durability, safety and comfort without impairing performance. The range also offers greater than 45% force reduction, making it unrivalled in the marketplace in terms of offering comfort for users. Taraﬂex® also meets the EN Standard of 22196 for anti- bacterial activity (E. coli – S. aureus – MRSA) (3) returning >99% levels of growth inhibition. The product is also treated with Protecsol®, which renders polish redundant and is triple action meaning no polish is ever required, it contributes to easy maintenance and is anti-friction burn and slide/grip. Taraﬂex® has a double density foam backing and as another bonus, it’s environmentally friendly. Chris Long finally commented, “We use Gerflor products a lot and would have absolutely no qualms in ordering their products again. In our line of work, it’s all about supplying quality and that’s exactly what Gerflor provide”.